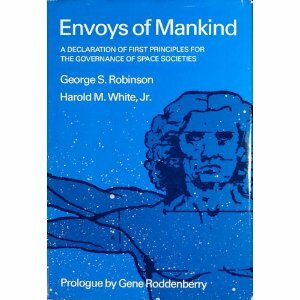 Envoys of Mankind were the essential words used to describe humans in space by international law adopted over forty years ago. Humans from around the world are now going to space as the “envoys of mankind,” a legal moniker adopted in the Outer Space Treaty and the Rescue of Astronauts regime by members of the United Nations. The importance of this international law is growing in importance everyday as commercial space launch capability expands to place more and more non-government ‘envoys of mankind’ into space in this decade. It is probable, if not likely, that there will be a commercial Apollo-13-like mishap on orbit with a micrometeorite piercing the hull, an electrical shutdown, on-board fire, or some other now unknown event that causes the call for help to go forth to others in space. This new ocean of space is to be sailed with ships of many nations. It is almost certain that the Chinese, Russians, Indians and Americans will be sailing the ocean of space in the years ahead. One, if not all, will face their own human space crisis. The spirit and the letter of decades old international law demands that nations be prepared to offer one another assistance in orbit of Earth or the moon. Several members of Congress appear not to be willing to obligate, or to receive, assistance from Chinese-made space vehicles or their human crews despite the international law. Mostly notably, Virginia Congressman Frank Wolf questions cooperation with the Chinese in space, citing human rights violations or military technology transfer concerns. The Congressman has legitimate concerns with the Chinese. The question is whether this is the correct venue to seek to enforce it. Space may not be the proper venue when it comes to astronaut rescue. Sino-American relations are not perfect but most analysts have characterized US-China foreign policy as complex and multi-faceted. The People’s Republic of China and the United States are neither allies nor enemies. The American military establishment does view China as an enemy, but as a competitor in some areas and a partner in ours. The United States must decide if China is a competitor or partner is space affairs. In either case, international law obligates both nations to cooperate when the lives of “envoys of mankind'” are at stake. American commercial space launch firms plan to place more humans in space in this decade than the number all nations have over the past fifty years. It would be an error not to have a bona fide protocol to provide one another assistance in space if the situation demands. Like Nixon, it may be that Congressman Wolf is the more appropriate person to open this door to the future in Chinese-American space relations and to suggest some space détente rescue pact among American, Chinese, Indian and Russian space agencies. Cooperation does not have to be difficult. Human spacefaring nations need cooperation on ship-to-ship communication protocols, docking ports, oxygen and water hose sizes, and the like to save the lives by those opting to spaceflight in the decades ahead. The United States need not transfer the designs of our booster rockets or the next spacecraft design to visit an asteroid to accomplish a mutual rescue in space plan. The United States need not wait the siren call of a Titanic-like space mishap to determine if we have measured-up to the spirit of international space law. We need not determine the ethnicity of envoys of humanity to determine their worth of a space rescue. Whether or not they are Chinese, Indian, Russian, American NASA astronaut or a private American space tourist, Americans need to lead in the development of protocol and etiquette in providing assistance in space emergencies. There will be another Apollo 13, Challenger or Columbia mishap in space by Americans. Equally, there will be life-threatening problems in space for the Chinese, Russians and Indians. We need not adopt domestic policy that demeans the international law to save the lives of fellow envoys of humankind. Quite the contrary, America needs men like Congressman Wolf leading the way ensuring domestic codification of the international astronaut rescue agreement for 21st century spaceflight. Those that attack NASA Administrator Charles Bolden’s trek to China this coming weekend need to think about this content.